Our new hotel in central Prague offers innovative concepts of accommodation and a club with a very young manager in the head, strives for your comfort in Prague, even at a time of economic recession. We offer accommodation in the city center for very reasonable prices - in rooms with a jacuzzi or shower where we will fulfill all your secret wishes of relaxation and wellbeing. 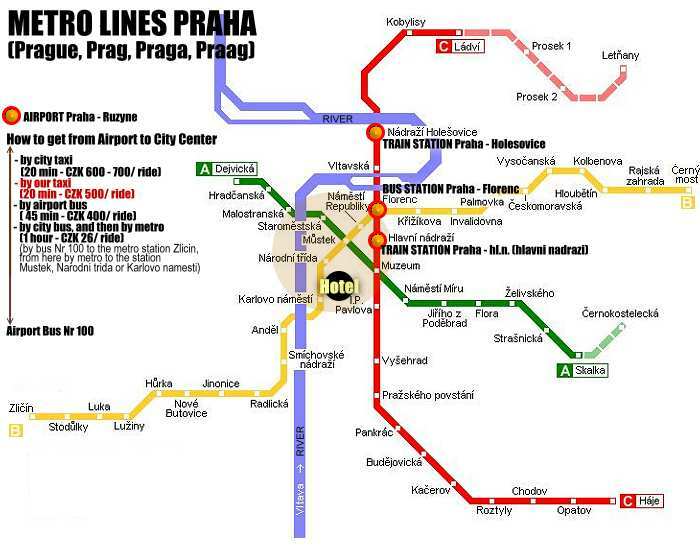 from the international train station Praha-Holesovice - by Metro "C" to the station "Florenc", here change in the line "B" and go to the station "Karlovo namesti"
from the Main Railway Station - by Metro "C" to the station "Florenc", here change in the line "B" and go to the station "Karlovo namesti"
1/ to reach the city center (our house) by the city bus and then by subway is very complicated. The duration is 1 - 2 hours. The passenger can get lost!!! 2/ to reach the city center (our house) by the city taxi could be very expensive. Passenger can pay two times or three times more!! !